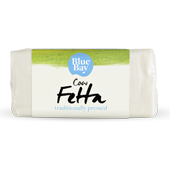 Blue Bay Cheese - Taste the Blue Bay difference! 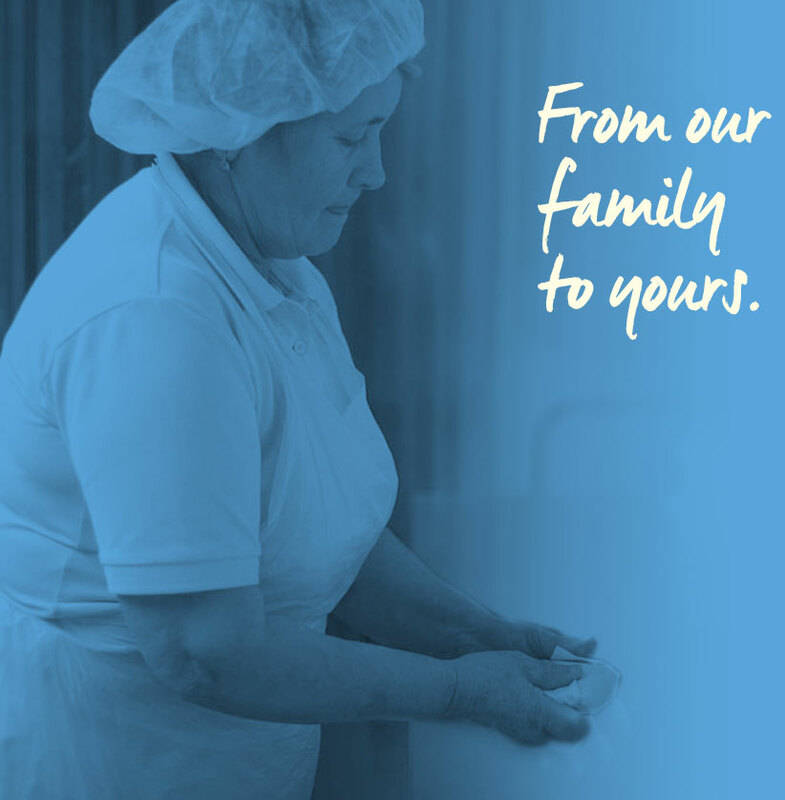 At Blue Bay we pride ourselves on our delicious, quality and healthy products, and are driven by our principles of simplicity, freshness and time-honoured tradition. With milk freshness an absolute priority, Blue Bay’s driver collects milk directly from local farmers to turn it into product within hours of being milked. Utilising our unique pasteurisation techniques requires time and patience, ensuring that the maximum amount of nutrients are retained, resulting in a better tasting product that is high in quality and taste, which is genuinely healthy. 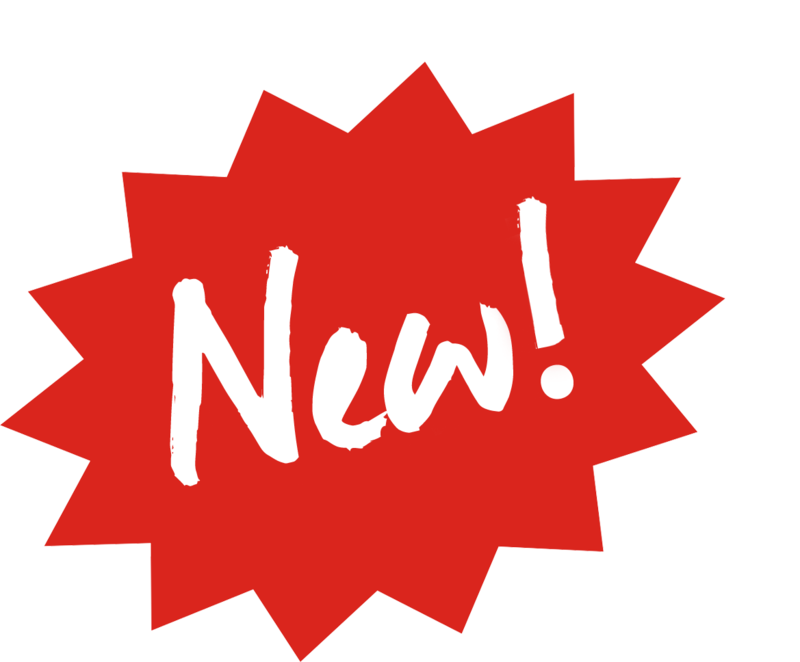 All products are made gluten free, without preservatives and animal rennet! Fresh from the Mornington Peninsula. Passion, expertise, health and smiles! While kefir is great to consume on its own daily, cooking and preparing food with kefir is also versatile and easy. Just store it upright in the fridge so the fat cap stays in place. Because it is acidic it can be used in recipes where cultured buttermilk is called for. The lactic acid activates baking soda, making for fluffy pancakes. It is perfect blended with ice and fruit – and perhaps a little honey – to make a delicious smoothie. 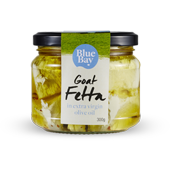 Because it has a subtle savoury flavour it actually makes superb dressings: fold through some olive oil, salt and a little garlic and used to dress a salad or pour over BBQ lamb. Award-winning quality that is delicious and healthy – meet the family! 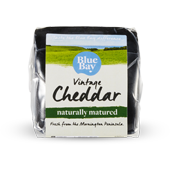 Blue Bay’s vintage cheddar is creamy, not overly sharp, yet has all of the complexity of an aged cheddar. 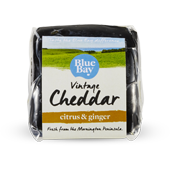 Our Vintage cheddar with just the right amount of citrus and ginger to complement the cheese, adds a surprising sweetness which balances the savouriness of the cheese perfectly. A firm, crumbly, sharp fetta. Great for salads and pizza. 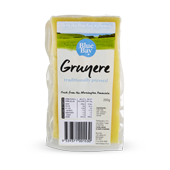 Our Gruyere has a distinctive, slightly salty, yet not overpowering flavour profile with superior melt properties, making it one of our most versatile cheeses. Quark is a European cottage cheese which is used in cheesecakes, baking, dips or simply spread on bread. Blue Bay’s Quark is made using our family recipe which has been passed down from four generations. 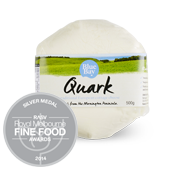 Our quark has won awards at the Royal Melbourne show in both 2013 and 2014. 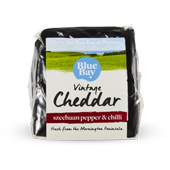 We have added the exotic flavours of Sichuan and chilli from the orient to our vintage cheddar for a flavour explosion which is perfectly balanced and not overpowering. Try it with a good red wine. A “Persian-style” fetta, light in texture, yet firm and not crumbly. It is a real winner either mixed into salads or simply with crackers. 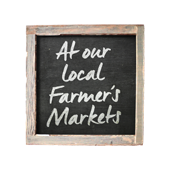 We allow our non homogenised cow yoghurt to set naturally in the pot without thickeners or preservatives. Traditional to Eastern European, our yoghurt is not thick and uniformed in texture. 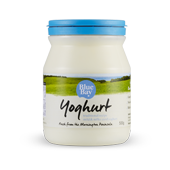 It’s mild and milky flavour has everyone eating this natural yoghurt straight from the tub. Available in 500ml and 1lt. 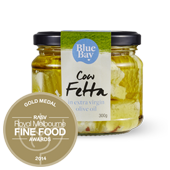 Blue Bay’s brie is a popular cheese due to its mild, slightly nutty, universal flavour which goes well when entertaining. 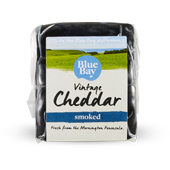 Our smoked vintage cheddar has a bold, deep flavour while still retaining the creaminess of our vintage cheddar. 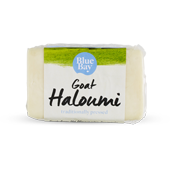 A soft, delicate texture and a mild goat flavour. 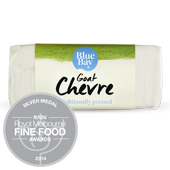 Our chevre is soft and subtle in flavour which is only achievable from grass fed livestock and mild processing conditions. Like all of our soft cheeses, our chevre is traditionally made by hand. Also available with dill. 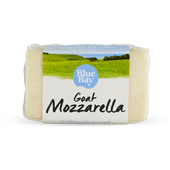 Rarely made by cheese makers, our goat mozzarella is mild in flavour and great for those with diary intolerances. 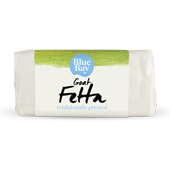 A ‘Persian-style’ fetta with a smooth texture and a mild goat flavour. Ideal for those who have intolerance to cow’s milk. A similar mellow flavour to our goat mozzarella yet lower in moisture, so it’s perfect to throw on a summer BBQ. Go ahead, impress your guests. Aged for 2 years, Caprino is a hard goats cheese which has all the complexity of an aged cheese yet still subtle in flavour. 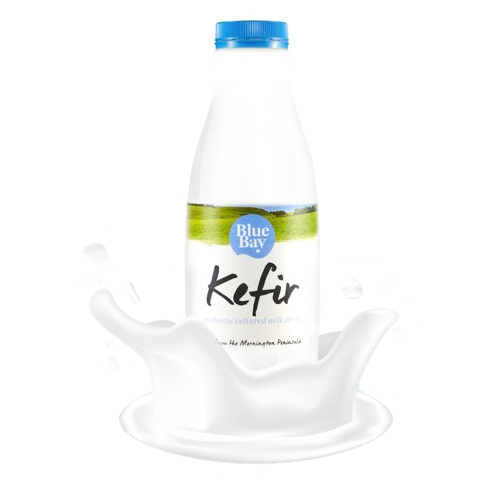 Kefir – feel the Blue Bay difference! Kefir is a traditional fermented dairy drink with a mild ‘tang’. Consumed for centuries for its health benefits, Kefir is similar in texture and flavour to yoghurt – but with many more benefits. The probiotic level or effectiveness of yoghurt is measured by CFUs (colonising forming units). 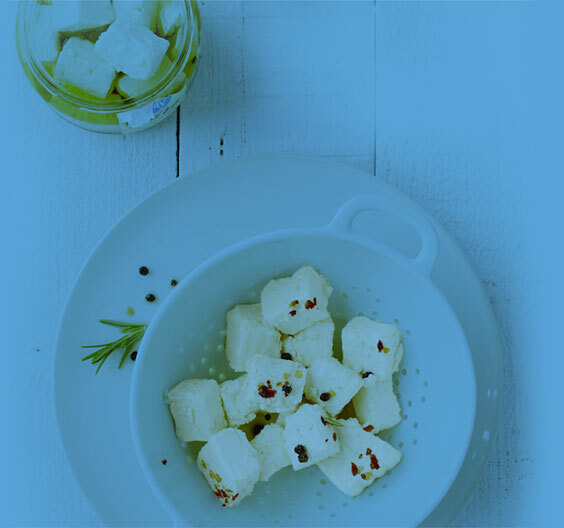 For yoghurt or kefir to have a positive effect on a person’s digestive system it must contain at least 1 billion CFUs per serve, which many yoghurts on the market today do not. 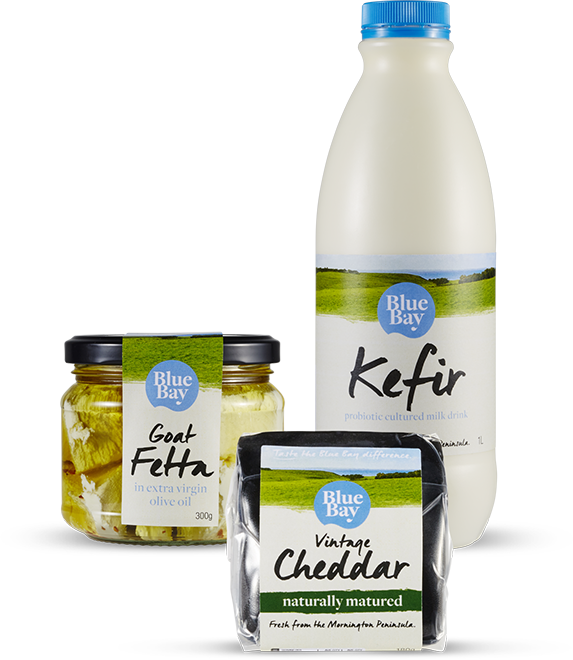 Blue Bay Kefir contains over 12 billion CFUs per serve AND this number will continue to grow during its shelf life. Most commercial yoghurts have 3-4 strains of probiotic bacteria. 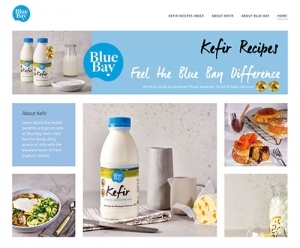 Blue Bay Kefir contains 10 strains. The probiotics in yoghurt and fermented milk brands are only beneficial while it is passing through the intestinal system, meaning they must be consumed every day. 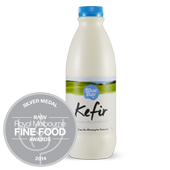 Kefir can help sufferers of allergies, diabetes, autoimmune and intestinal disorders and help with day to day intestinal health. Kefir is often recommended by doctors for patients taking antibiotics or having chemotherapy. How much kefir should I have? We recommend minimum 200ml of kefir daily or more if preferred. Shake the bottle well before opening. Drink it straight or have it with muesli or in a smoothie. The powerful probiotic boost of our cow kefir will help to restore intestinal balance. Enjoy kefir in a smoothie or on your cereal or muesli and remember to shake well before use. For those who have intolerances to cows milk or are sensitive to A1 proteins can still get their probiotic boost with Blue Bay goat kefir. Enjoy goat kefir in a smoothie or on your cereal or muesli and remember to shake well before use. 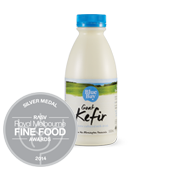 The benefits of kefir can be substantiated by decades of research. Here are some examples: Guzel-Seydim ZB, Kok-Tas T, Greene AK, Seydim AC. “Review: functional properties of kefir.” Crit Rev Food Sci Nutr. 2011 Mar;51(3):261-8. Vinderola CG, Duarte J, Thangavel D, Perdigón G, Farnworth E, Matar C. “Immunomodulating capacity of kefir.” J Dairy Res. 2005 May;72(2):195-202. Bekar O, Yilmaz Y, Gulten M. “Kefir improves the efficacy and tolerability of triple therapy in eradicating Helicobacter pylori.” J Med Food. 2011 Apr;14(4):344-7.